The sun’s brilliant mantle slowly descends over the shadow cloak of night, revealing the most majestic mountains on this earth. Welcome to Banff, Canada. Draw back the drapes, step out onto the balcony, and you will find an invigorating adventure along the Bow River and Bow Falls trails waiting below. Although these out and back trails are only approximately 1.5 kilometers along the north and south shores of the Bow River, make note of the potential this outing has to offer. A promise of uplifting and exhilarating beauty in nature and of pristine peace lies along the paved pathway ahead. The meandering trail begins along a still, mirroring, lake-like section of the river, with clear pebbled shores launching early morning canoeists. Mule deer graze and bunnies bounce freely. A moose watches at a distance, sniffing the scented air. Around the bend is a museum dedicated to the history of Indian nations indigenous to the area. Up ahead is a park with soft, lush grass to stretch out on. Take in the fresh mountain air, listen to guest performances from the band shell, or sit on one of the many benches and merely watch the people and the river go by. Along the way, the river quickens and the trail begins to take on a more aggressive nature with a slight incline that’s shaded in heavy forest. The shoulders of the trail disappear and the incline steepens, down to a raging river below. Vantage points from frequent rest stops offer panoramic views of breathtaking mountains—sheered forces of granite, awesome and inspiring. 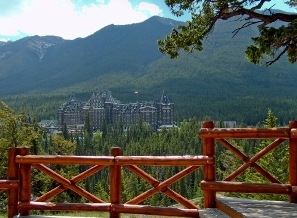 Through the trees you’ll glimpse the world-renowned Fairmont Banff Springs Hotel in the heavily forested mountainside. Approach via a walking bridge, and the hotel rises up in castle-like grandeur, a bustle of activity and laughter ringing in the air. Below, the rapids become wild torrents of twisting swirls and sprays. River rafters climb into bright orange outrigger dinghies to ride the rapids in pursuit of a thrill. 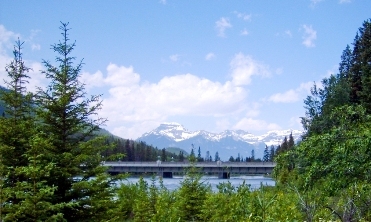 The walk back to town is a series of natural views and vistas framed between peaks. On this side of the trail you’ll climb and descend timber steps with strong rails and encounter friendly hikers along the way. Banff is a one-hour shuttle ride from Calgary to an indelible experience of a lifetime. Hiking tips: For maximum comfort while hiking in Banff, wear sturdy outdoor walking shoes or sandals with a 100% cotton sock, a nonrestrictive pant leg, and a light, windproof jacket. Don’t forget your sunscreen, and carry a nutritious lunch and beverages, as well as a charged cell phone.